There is still a room for upside in holding companies which are trading at a sharp discount to their intrinsic value, said analysts. Holding companies outperformed last month as a steep discount in market valuations to the value of their investment book prompted investors to lap up their shares when the overall market was weak. Stocks such as BF Investments, JSW Holding, Maharashtra Scooters, Kama Holding, Balmer Lawrie Investments, Bombay Burmah Trading, Bajaj Holding and Kirloskar Industries rallied between 10 per cent and 20 per cent in the past month against a 1 per cent gain in Sensex. 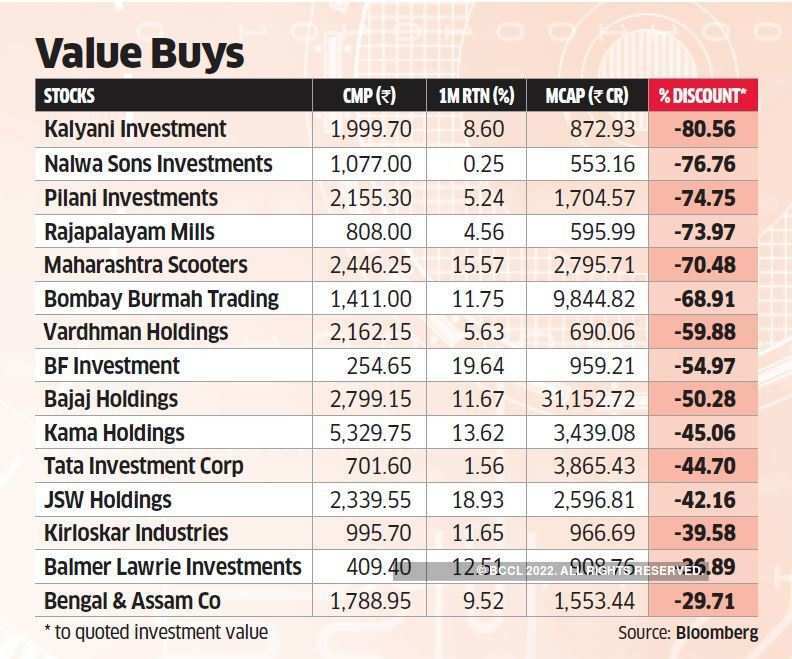 Williamson Magor, Kalyani Investment, Nalwa Sons Investments, Rajapalayam Mills, Pilani Investments, Maharashtra Scooters and Bombay Burmah Trading among others are trading at 70-80 per cent discount to their to their respective portfolios. If the current value of their unquoted investments is taken into account, the discount in some of the companies would widen further. Bajaj Holdings holds 31.54 per cent in Bajaj Autoand 39.29 per cent stake in Bajaj Finserv. The company also has an investment portfolio with a market value of nearly Rs 7,000 crore in other equity and fixed income securities. The company’s dividend payout ratio is nearly 14 per cent for the FY18. If the discounted value shrinks from current 50 per cent to 40 per cent in near term, the stock would gain 20 per cent, said Baliga. Bombay Burmah Trading Corporation, which own 50 per cent in Britannia, is currently trading at a discount of nearly 70 per cent to its investment value. Also, BBTC owns 2,822 hectares of tea estates in south India and eight coffee estates in Karnataka. Assuming industry average of 49 per cent discount to the market value of investments it holds in Britannia and Bombay Dyeing, BBTC would be valued at Rs 2,700 in the next 2-3 years, said G Chokkalingam of Equinomics Research. “Generally holding companies trade at 40-50 per cent discount, but currently discounts have widened dramatically,” Chokkalingam said.